Ask fellow campers about "Piney River Escape" and nearby attractions. The pictures & reviews online are nothing like what we saw! First off we drove almost 3 hrs to get there & was told the site we reserved was still occupied with previous camper, we were shown a different site on the water, too close for my liking, the other section was like a trailer park with long timers. I could go on but hopefully this is enough to make people aware & beware! We camped at Piney River Escape in a Fifth Wheel. Shopping about 15-20 from Campground. What a wonderful park. We had a river (big fast moving creek)front site, got lucky, they stay full. The roads getting there are bad... just slow down, you will be okay. The only drawback to the creek side was flash floods... kinda scary watching it rise. They were still recovering from a nasty flood in Nov 2017. The regular sites are way up the hill and high and dry. They are more park like, still very nice. People in this park, a lot of monthly.. a few even visited, were super friendly. The hookup connections were a little rough all though, they were working on it, just trying to be honest, only thing that kept it from a 10... The camphost... cant say enough good things, what a privilege to meet you sir. We are trying to pick a time for a longer stay in the Fall. We had good internet on our Sprint on our hot spot. Follow their directions, NOT GOOGLE!!!! We will definately, absolutely return. FREE LAUNDRY!! We camped at Piney River Escape in a Fifth Wheel. Dickson is near.. check out Amish Grocery - Country View Market, 15 miles or so... grocery stores at minimum 10 miles. This campground has been given overly generous reviews. It is a nice site on a farm and river. The host and campers were all friendly and helpful. However, there are other issues that need to be brought out. The facility is remote on rough chip and seal blacktop roads. The facility is not well designed for easy access internally. When you come in the entrance and pull to the exit where the office/host site is the only way to get to a site is to back to it. When you go back out the exit from the office, there is not enough room on the narrow public road to turn a car back to the entrance much less a camper. The site (they are not numbered) we were on was poorly plumbed for waste. The inlet was on the uphill side of the slab. I could not set up a downward slope to the inlet from beneath my motorhome. Parking slabs are narrow with no patio. For access to utilities on the driver's side I had to pull into the site and back out on leaving. The roads and area around the sites were muddy. The sites near the river, were laid out parallel to the river rather than oriented for easy access. Some were well off the graveled road with no harden access. The gravel access had water running across the road the day we arrived. We were advised that use of the river sites would be risky due to flooding potential. We enjoyed our stay because all we needed was a parking spot for a week. We will camp elsewhere if we are in the area again. 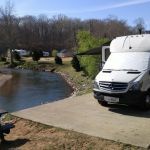 We camped at Piney River Escape in a Motorhome. concrete sites with fire ring and picnic table. We camped at Piney River Escape in a Fifth Wheel. It's the most quite and peaceful place we've ever been to. We have enjoyed the river water greatly! It's hard to explain but once you get there you simply relax. The owner is a really great guy. He usually has only one spot that he can give you if you're staying for only few days. You'll need to book many months in advance if you want to stay for few months. Its one of these places that you can overlook or miss, it's not a usual campground, there are only few spots for RVs but it is magical. Laundry was free. We didn't use the bathrooms or shower so we can't say much about it. The Piney river runs through the campground and is great to swim in. The kids that were around loved it. It had a Wi-Fi connection but very slow. We camped at Piney River Escape in a Fifth Wheel. Tell the owner you prefer not to be behind the showers/bathrooms! Unless... Its the only spot he has. This is a wonderful small family oriented campground located on the bank of the Piney River on a family farm. There are a couple of pavilions adjacent to RV sites that generally are rented full time. There is one rest room and one shower available, the laundry facilities are located across the road. It is a Good Sam park, so discounts apply. Occasionally, the owner hosts blue grass/country music "jams" at the park, usually with some local up and coming talent. Our stay was during one of these and we had a great time. Swimming, floating, and canoeing the Piney River is great fun for the young, so everyone will have a good time. COME! We camped at Piney River Escape in a Truck Camper. Are you affiliated with Piney River Escape ?